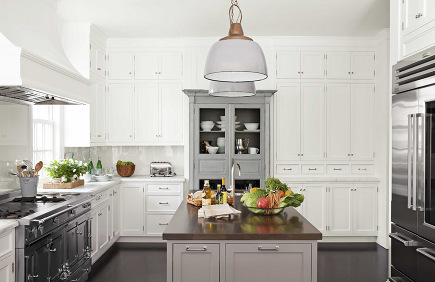 The French gray hutch in a wall of new cabinets is one trick of the trade used in this soft palette kitchen. Many from the kitchen obsessed crowd would start buying for their dream kitchen with a French range. But the first purchase for designer Samantha Lyman and her client was the pair of vintage Dutch ship lights for her kitchen. The large scale vintage pieces are copper with an enamel coating — an amazing find — and flawless over the island. The lighting beautifully complements the charming gray hutch, also antique. Lyman inset the 19th-century French bibliothèque into the wall of modern cabinets painted C2’s Architectural White. Here’s a helpful hint from Lyman — the old armoire was only a foot deep so the cabinetmaker refashioned the piece by cutting off the back and adding another two feet to its depth. Now the armoire is large enough to display large serving pieces on the upper shelves and store cooking pots below. Chicken wire doors have aged to an ideal charcoal gray. The dark painted interior finish hides any evidence of the addition, and is the perfect backdrop to showcase white dishes. The warm brown-gray island (C2 Fusion) has a walnut counter that was bleached to get rid of its reddish undertones, then finished with warm chocolate stain. The island features a Waterworks Normandy prep sink paired with a Dornbracht Tara faucet. Not visible is the warming drawer, across from the range. The prestigious La Cornue Château 150 has both gas and electric ovens. The cooker is serviced by a pot filler, also by Dornbracht, and a Vent a Hood liner under an unobtrusive custom hood. The backsplash is tempered Starfire sheet glass that was painted on the back. This brand of glass eliminates the green cast normally seen in glass. In order to avoid showing wall blemishes, spray paint the back of the glass before installation. A Sub-Zero Pro with glass door balances the wall opposite the range. The perimeter counters are wrapped with Calacatta marble. 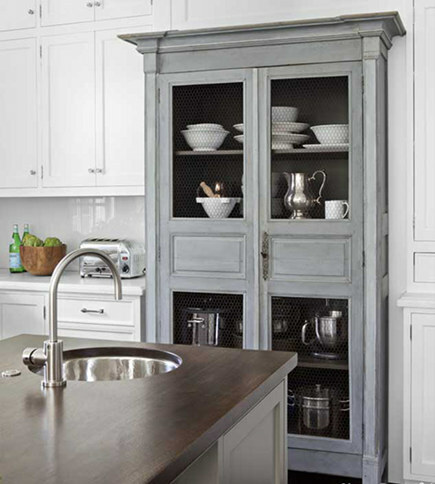 With so many cabinets, the thought to use smaller scale Gilmore hardware from Restoration Hardware keeps them from getting too busy. Underneath it all is ebonized oak flooring with a waxed look finish. 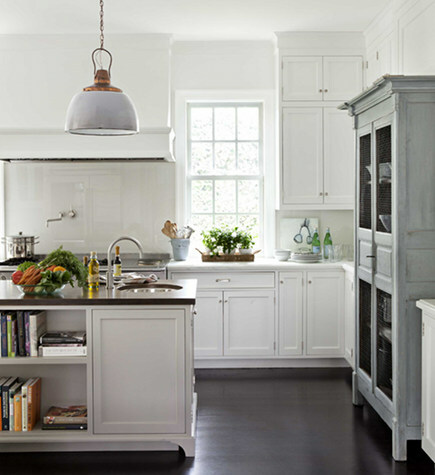 A peaceful color palette and a little imagination makes this a distinctive kitchen in the sea of trendy white. Interesting and cool… Even better with the hidden adjustments to be more useful!